Casey At The Bat was first published in The Daily Examiner, June 3, 1888. Nero Wolfe couldn’t care less about baseball, even the World Series final game–until four players are drugged. Now a team’s chances, and maybe their star players, are dead. Evidence is hard to find, so Archie Goodwin dodges fists and acid while the boss keeps one little secret from the police. There’s a whole team of suspects for Nero Wolfe to confront in this peppy locked stadium mystery. Narator David Elias is terrific, filling his lungs for the resonant corpulence of Wolfe’s voice, then higher pitching and faster talking-it for the energetic Archie Goodwin. As well, Elias offers many variation’s on accents and voices for the numerous other minor characters filling out this novelette. He also ain’t bad with a falsetto. The abridgment is very skillful. 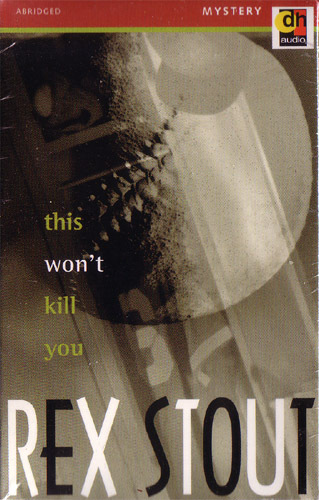 Rex Stout’s plots are often highly complex, and can lead a reader to be confused as it is. Whatever was expunged for this edition, this audiobook abridgment is easy to follow. 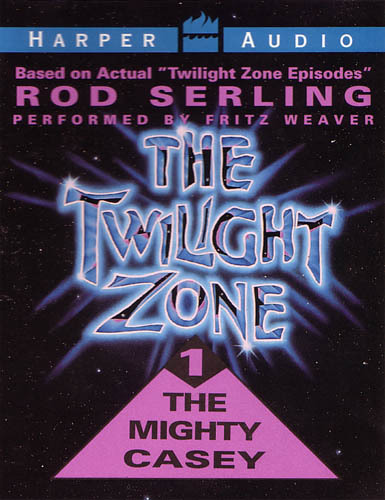 Rod Serling’s The Twilight Zone is revived for audio in the form of unabridged short stories by Rod Serling. All the stories in this series were previously adapted for the original Twilight Zone television series. This is the first in a series of six single cassette adaptations read by stars of the original series. In this case, Fritz Weaver spins the tale of “The Mighty Casey”, an almost mythical player for that near-mythical sport of baseball. The Brooklyn Dodgers were down in the dumps until tryouts turned up a talented left hander with a pitch like nobody’s business. Casey, the pitcher “with an exceptional left hand”, inspires the tired old players to new glory. They become the team to beat. Everything was swell until Casey gets beaned by a ball. A doctor is summoned and pronounces that Casey is alright, but then the doctor has trouble finding a pulse. It’s soon discovered that Casey is actually a robot and as such does not have a heart! When thinking of baseball, most people probably associate the name Casey with the Ernest Lawrence Thayer’s 1888 poem “Casey At The Bat”. It’s clear to me that Rod Serling tapped into it for inspiration. “The Mighty Casey” is a very funny story. The dialogue is humorous and the situation is funny too, but it also has a lot of pathos. The story is entertaining but also has that most important of Twilight Zone elements, a twist with a satisfying ending. Fritz Weaver has great fun playing the characters, especially Mouth McGarry, the comic manager of the Dodgers, a character full of deep anxiety and deeper ignorance. This is pretty light material for The Twilight Zone, which often deals with the darker elements of the Human condition. Presented like an actual episode of the television series, there’s the haunting Twilight Zone music and an introduction just like Serling used to make. I actually listened to the tale twice, and I enjoyed it even more the second time around. Overall its a very good start to the series.